It is almost October in Missouri. For fisherman, that means that it is time for the annual Fall Big Bash Bash (BBB) at Lake of the Ozarks. The fall tourney is always the first full weekend of October and draws thousands of fisherman in search of one great bite that will mean pay day. The Big Bash Bash is an excellent tournament because it gives everyday fisherman the chance to compete for real money like the big boys of the FLW or Bassmasters do on their circuits. This tournament is different, however, from regular fishing tournaments. In the BBB, fisherman are really only looking for one good bite. Big fish for the day will win someone $100,000. Second place will take home $20,000, third is $10,000 and fourth is $5,000. More than $105,000 guaranteed in bi-hourly payouts with a total of 240 places paid. 30 places will are paid for each of the four time slots (7-9, 9-11, 11-1, 1-3). Typically, fisherman are looking to weigh five fish for the heaviest weight. I have had several friends fish recent Big Bash Bashes on Lake of the Ozarks, and I have always been curious about their strategy. A few of them have taken checks in recent Bashes which is really quite an accomplishment given the number and quality of anglers. After listening to them as well as formulating my own plan of action, I have my own roadmap to hopefully take a check at this year’s BBB. I know this sounds funny, but how many times have you been pre-fishing for a tournament and hook into a nice 4 lb.+ bass. I believe that I fish better when I am not under pressure to win. Take your time and enjoy the day. Fish like you want to fish, and don’t be inundated with information from anyone and everyone on the Internet and friends of friends. Go out and fish the way that is comfortable to you, and gives you the best confidence in catching fish. There are going to be a ton of boats on the Lake for this tournament. Chances are that at some point in the day, I will be following someone down a bank. When that happens, I am going to be very aware of what the people in the boat in front of us are throwing. My plan will be to show the fish something different. If they are fishing, jigs, I am going to switch to a large swim bait or spinnerbaits and search for fishing in a different part of the water column. I could also use a different type of bottom bouncer to present to the fish something different. If they are fishing show and picking apart a piece of structure, I might try a faster presentation and go for a reaction strike. While I will have a few “regular” lures tied on my line, the majority will be large jigs, swim baits or other large-profile baits. I am looking for one bite all day. If a fish hits one of these baits, it will most likely be a money fish. If you have had the chance to place your own brush piles in the Lake, then you are in luck. If not (like me), you have to rely on the handy work of others. When pre fishing for any tournament, I am always very aware of other fishermen on the water. I pay special attention to those boats who are camped on a bank that would not be a “typical” bank. A good example would be someone who is fishing a do-nothing bank, and they are not moving very fast. Chances are, they are fishing some out-of-the-way brush. Once they leave, I go check out what was making stay in that spot for such a long period of time. 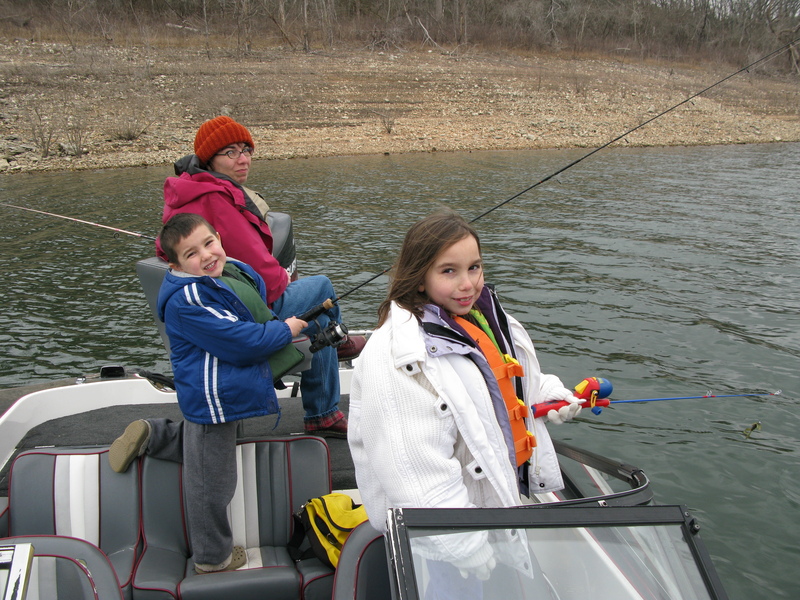 We had a great day on Bull Shoals Lake yesterday. The day started with me taking my family out fishing. The weather was cold and windy at that point so we did not expect to be out long. I did not expect to catch many fish (if any)…so we focused on them casting their rods so they could at least be “doing” something. While they were casting, my wife and I were dragging grubs behind the boat with the wind. After we had lunch, my father-in-law and I went to the very back of Big Creek. We chased the largemouth and Kentuckys instead of the white bass this time. We found a long channel swing toward the end of the creek. This bank always holds fish this time of year, and today we found them. The last 100 yards of the bank produced nine fish with one keeper Kentucky bass. We fished primarily Smithwick rogues which are perfect for early spring fishing. I stuck with my go to color – “Red Sunrise”. I have consistently done well with this color on Bull Shoals. The water temp varied from 48 degrees all the way up to 52.5 degrees. In about two or three weeks, this lake is going to explode with fish moving up on the banks. I went with my father-in-law, Tom, and we decided to take his boat. Just before we left, I grabbed my gear out of my boat to take to the dock. I saw a small Swimming Minnow on my front deck that I had used to chase crappie last year. I RARELY chase crappie and this is one of only a few crappie lures I own. I grabbed the small chartreuse and green lure, and we headed to the dock. We got to the back of Shoal Creek where we found just one other boat. Typically, when the whites are running, one person tells another person and next thing you know, half the county is in the back of the creek with you. I started throwing a 1/4 oz. Rooster Tail and caught a white on my fifth cast. After about an hour, I had three fish in the boat and Tom had one. We drifted by the other boat in the creek and asked how they were doing. 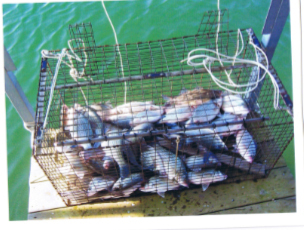 The responded that they were catching a lot of fish on Swimming Minnows. Naturally, I switched to my sole Swimming Minnow and ended up catching 15 of the 18 whites. My partner wasn’t exactly thrilled with my luck. Every time I hooked a fish, I heard a definite expletive from the front of the boat…usually starting with an “M” and an “F”. As a general rule, when either of us buys a lure, we like to buy more than one so we can give our partner one if the fish are hitting it. That way we both catch fish. Unfortunately, there was only one of this particular Swimming Minnow in the boat, and, of course, that is the one that caught all the fish. 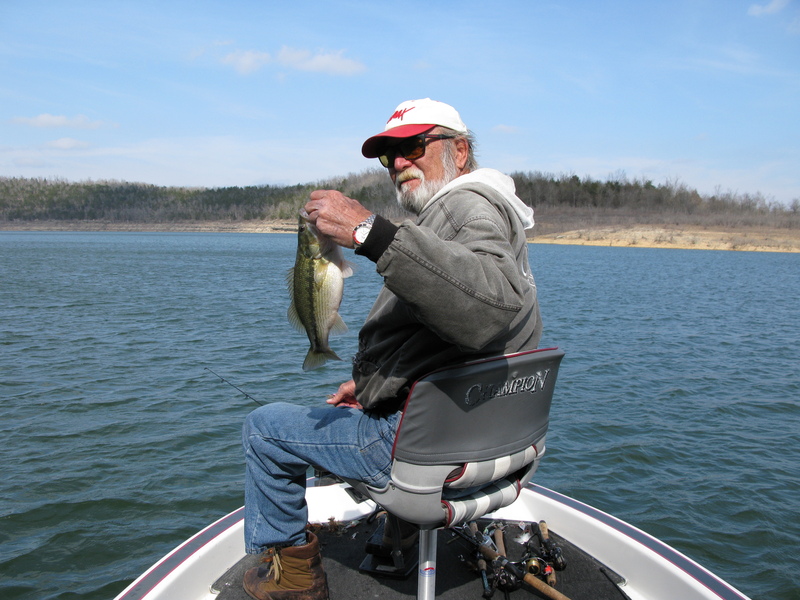 Tom is an excellent fisherman and has been fishing on Bull Shoals since the 60s. He always knows how to put fish in the boat and rarely do we come in skunked. Today was just a day where the fish wanted a certain color, and I was the only one with that color. We are taking my wife and kids out today to let them have a go with these whites. I will have my camera in hand and will post about the day’s adventure…tomorrow. One of my greatest pleasures in life is to be standing on the front of my Champion bass boat while heading down a bank in search of lunker largemouth bass. Unfortunately, many of us are not lucky enough to have their own bass boat and have to fish with someone else who DOES own their own boat. When this happens, you are stuck fishing from the back deck of their boat. There are many advantages to fishing from the front of the boat. For example, you get to run the trolling motor…which means YOU get to make the decisions of where exactly to fish (depth, structure, location, etc.). You also get to decide on the speed of the boat as it heads down a bank which means you get to decide if it’s going to be a Wiggle Wart day or a Chomper’s day. To put it bluntly…you are in control. For those of us who get to fish from the back deck of the bass boat, don’t despair! Even though I own my own boat, I often fish with my father-in-law in his boat since his boat is already in the water on a lift in his stall. This means that I don’t have to haul my boat five hours and spend a bunch of money on gas just getting to the lake. He always runs the trolling motor which leaves me on the back deck…and there have been many times where I have caught more fish than him! There are ways you can improve your odds fishing from the back deck and catch more fish. Following these suggestions will allow you to keep some control over your fishing experience. First, if your partner is catching fish, you get the advantage of watching exactly what he is doing with his lure. You get to analyze his cast (is he flipping, pitching…is the lure hitting the water softly…landing on the shady side of a stump, etc.). By identifying what he is doing, you can mimic his approach which will help you land more fish. Second, don’t fall into the repetitive cast-and-retrieve without thinking about lure placement. Break the water up into small sections. Watch where your partner casts, then cast to an adjacent section. Dividing the water up will allow you to fish “new” water even though it might only be four to five feet away from where your partner placed his lure. Sometimes, a few feet will be the answer to a fish deciding to strike a lure. Third, change the cadence of your lure. If you are both fishing a grub, and he’s hopping it on the bottom like a jig-n-pig, then you can try swimming it or dragging it like a Carolina rig. By switching up the cadence, you have better odds of finding out how the fish want the bait presented. This technique is especially helpful in tournament situations. Lastly, when the driver of the boat shuts off the big motor and climbs up to the front deck, reach over and turn the steering wheel so that the back end of the boat is turning toward the bank. This technique is extremely effective when you are paralleling a bank with a spinnerbait or crankbait. Having the back end swing in allows you to increase your casting area and gives you better access to the bank. It also allows your bait to be retrieved at a slightly different angle than that of the person on the front deck. I had the great opportunity to meet some of the women in the Gateway Bass’n Gals fishing club yesterday at Bass Pro in St. Charles, MO. The club had a table set up and was promoting their organization during Bass Pro’s spring sale. I spoke with Lisa Opfer, the club’s treasurer, and she was very informative as well as a pleasure to talk to. She told us that the club was organized to give women the opportunity to bass fish competitively among their peers. They welcome all lady anglers, experienced and beginners, to come join their club. 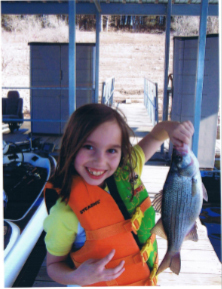 The Bass’n Gals Club was established in 1988 with the goal of promoting the sport of bass fishing among women and youth. The tournament schedule for 2010 includes seven events on lakes in or around Missouri. 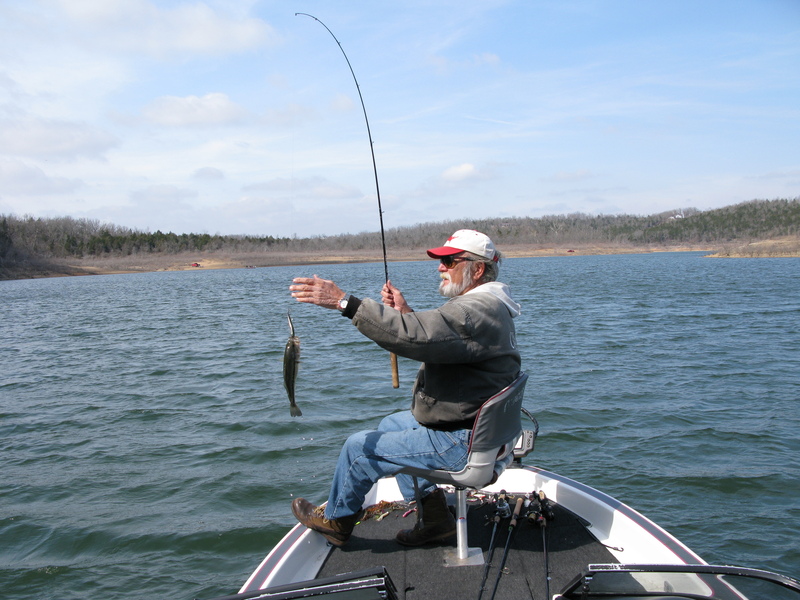 The lakes include Lake of the Ozarks, Table Rock, Kentucky Lake, Truman and Stockton. They also have a fun weekend at Lake Taneycomo near Branson. This organization is a great opportunity for any female angler looking to better this skills and meet other women who love to fish. Women today constitute more than one third of all anglers. They own and operate their own rigs, trailer those rigs to any given lake throughout the country and do fish competitively, just like their male counterparts. For the women who participate in the sport, bass fishing is a driving passion in their lives. It boosts their self esteem creates healthier minds and bodies. It significantly reduces their stress level, creating a happier family atmosphere. The Gateway Bass’n Gals strives to abolish the myth that women do not fish, and that bass fishing on a competitive level, is strictly a man’s sport. The beginning angler needs a place to learn and the accomplished, experienced angler cherishes the camaraderie she shares with her angling peers and is always willing to pass her knowledge on to beginning anglers. The Gateway Bass’n Gals are dedicated to providing just such a venue for ALL women anglers throughout our area. We invite you to join us in our efforts to grow the sport of bass fishing for all women. Gateway Bass’n Gals…. Promote fellowship, friendship and fun among women anglers to provide a wholesome organization for its members and their families. Gateway Bass’n Gals…. Help to improve the skills of anglers through the exchange of techniques, ideas and demonstrations. Gateway Bass’n Gals…. Continue to make our communities a better place for all, through it’s Kids Fish programs and charitable fund raising programs. The water is in the low 40’s. The extreme cold is gone (hopefully), and they days are getting longer. These conditions are perfect for suspending jerkbait fishing on your favorite lake or reservoir. March is a great month to be on the water. Fish are filling up with eggs which means the chances of catching a lunker are greater now that at any other time of year. The way I like to chase these lunkers is with a suspending jerkbait. When the water is cold, bass do not want to expend a lot of energy catching their dinner. Spinnerbaits and crankbaits are effective search baits in warmer water, but in the cold water, bass will often wait for an easier feast. A jerkbait can be fished many ways. Finding the cadence of jerks and pauses is simply a matter of trial and error. When the water is colder, I like to let the bait rest for at least 15 to 20 seconds between jerks. As the water temperature rises, I quicken the pace. Don’t be afraid to try different retrieves: jerk-jerk-pause; jerk-pause-jerk; jerk-jerk-jerk-pause; Let the fish tell you how they want it. Once they tell you, you can stick with that pattern for the rest of the day. The most important aspect of jerkbait fishing is to make sure the bait is neutrally buoyant or rising VERY slowly. Above all, you do not want your bait to sink. If your bait does not suspend correctly, you can add weight to it several ways. The first way is to add larger hooks. If the bait raises with #6 hooks, switch one or all of the hooks to #4 hooks. A second way to weight the bait is to add additional O-rings to the hooks. This should be done only when the bait is slightly too lite. The third way is to add lead strips or dots to the bait. Storm Suspend Dots are great tools for fine-tuning your suspending jerkbait. 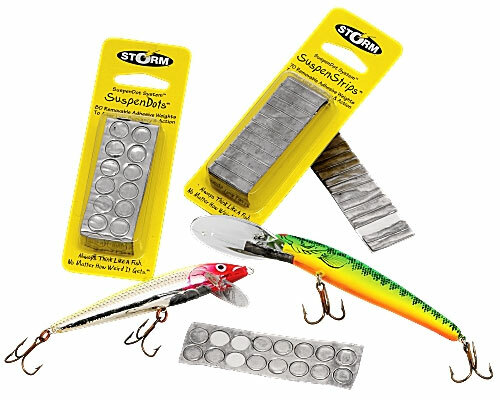 These strips or dots can be purchased at your local tackle shop and are placed on the front or middle of the lure so that it rests horizontally or with its head down. There are many brands of suspending jerkbaits on the market today. Perhaps the best-known is the Smithwick Rogue. The Rogue comes in many different colors and sizes. I primarily fish clear water reservoirs, so I like to fish natural shad colors. Darker water calls for brighter colors like chartreuse and orange. Whatever brand and color you choose, a suspending jerkbait is an extremely effective way to put fish in the boat during early spring. Contact me via the comments section if you are interested in custom-painted jerkbaits.